Kai Hansen was the person who initially gave Helloween their identity, creating thus melodic Teutonic speed metal. A few years later he was kicked out, replaced by a much more commercial sounding Michael Kiske who transformed Helloween into a true dream story that ended after two albums. In the meantime, Kai Hansen founded Gamma Ray, recruited Ralf Scheepers who didn’t sound that much unlike Kiske, and after a string of deteriorating album material, he decided, probably also under fan pressure, to take over the vocals again, just as he did on the first Helloween releases. It’s a fact: he was never what you call a good singer. His voice was thin and shaky, but at least it was his own, and when you heard him, you instantly recognised him. So in 1995, the release of Land Of The Free was a true revelation for melodic speed metal fans. It was as good as what he did ten years earlier, except better produced. Now, twelve years and a couple of albums later, Gamma Ray are back with Land Of The Free II, which is a strange coincidence, considering that Helloween just made a second sequel for their Keeper Of The Seven Keys series. Where Helloween in my opinion failed, Gamma Ray are doing just about everything right on their sequel. 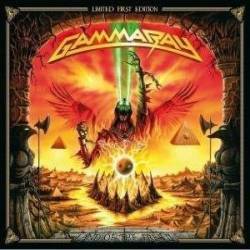 I have to admit that I somehow lost sight of the band after the first instalment a dozen years earlier, and maybe this new output is therefore aimed at people like me, who grew bored with today’s metal and are happy to have a refreshed Gamma Ray back. The album starts with the straight rocking heavy metal bomb Into The Storm, and although this is not yet a highlight, it portrays already a strengthened band that has regained its confidence. It’s not until the fourth track, To Mother Earth, where Gamma Ray finally run on maximum power. The song is cheesy, I grant you that much, but its melancholic ecological message is so un-metal that you have to take your hat off. Finally a band that dares to take a political stance again! From here on, you get more old school speed metal music that at times sounds like Iron Maiden hiring Queen’s Brian May on guitar. For a band that took its name from a song from a Seventies kraut rock band, it’s obvious that there are also influences from Seventies hard rock (Deep Purple, Thin Lizzy). Other highlights include the groovy Empress, the majestic Opportunity and the rationalist Real World which with its atheist lyrics might be reason enough for this album to be banned or at least burned by fundamentalist Christians in the USA. Yet again it proves that when Kai Hansen made his first steps in heavy metal, there was still a message in that genre. Sure enough, Land Of The Free II is a derivative piece of art, it’s not original at all, but that was never the point anyway. Gamma Ray wanted to go back to a time where they were in their best shape, and they achieved that without a problem. This is a worthy sequel to the original work in the Nineties, with enough catchy songs, fast guitar riffs, memorable solos and above all Kai Hansen’s unmistakable voice. Nowadays I don’t consider myself a heavy metal fan anymore, but Land Of The Free II truly managed to bring some tears to my eyes, and that hasn’t happened for a long time in this genre. I do have no other choice than give the maximum rating. Welcome back, Gamma Ray!